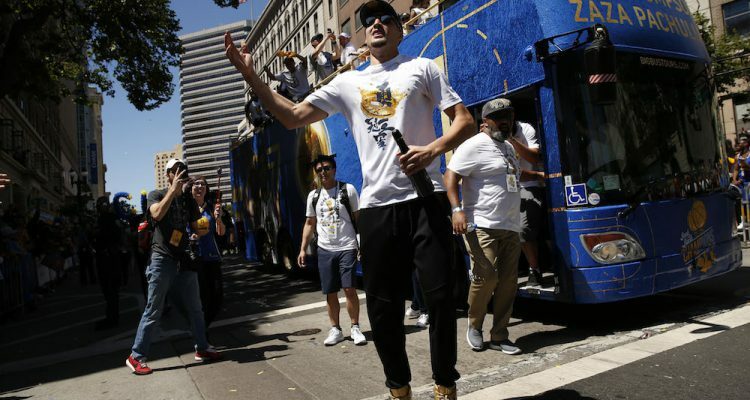 Klay Thompson’s trip to China is producing some pretty bizarre moments, the most recent of which actually happened on the basketball court. Thompson is known for his calm demeanor and stoicism, but a hard foul unleashed a side of him not often seen. TMZ Sports has a story about it with an accompanying video that shows how the events on the court unfolded and what led up to them. Thompson’s friend was playing in a pickup game and after a dirty play was committed by an opposing player, a fight nearly broke out. Just judging from the video footage, it looked like the game had drawn a pretty decent crowd of people, wherever it was being held. Thompson’s friend drove to the hoop and one of the opposing players undercut him as he elevated, sending Thompson’s friend sprawling to the ground. Those types of plays can cause serious injuries, and Thompson and everybody else around were absolutely justified in being upset. It was similar to the Patrick McCaw play this past regular season when Vince Carter took out his legs midair while McCaw was going up for a dunk. Thankfully this one wasn’t as serious as the McCaw one, as Thompson’s friend immediately hopped up and got in the other guy’s face. Klay then stormed the court and started cussing out the guy and telling him that plays like that can end people’s careers. Images of McCaw being taken off the court on a stretcher are obviously fresh in Thompson’s mind, and he was right to be mad. There’s no reason for plays like that, and players really have to do their part to police the actions on the court and make sure things like that don’t happen. Thompson was justified in being angry, and it was interesting to see a different side of him as he voiced his frustration.